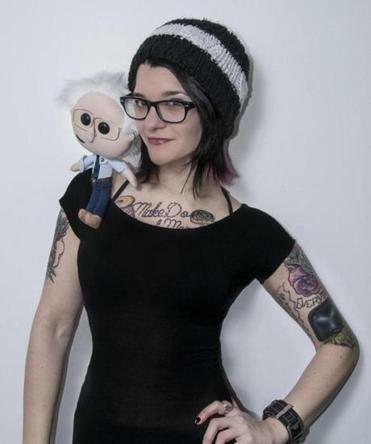 Emily Engel with one of her handmade Lil&apos; Bernie dolls. Among the collage of faces on Bernie Sanders’s website is Emily Engel of Ludlow. On her shoulder is a little old man doll named Lil’ Bernie. Someone brought this to her attention just prior to the New Hampshire primary Tuesday. Lil’ Bernie’s button eyes, disheveled white hair, and dark-blue tie have seemingly become a symbol of the Democratic president candidate’s devoted fanbase. After shutting down her Etsy account because she couldn’t keep up with the orders, Engel sent out an online S.O.S. for someone to help her meet the demand. She eventually gave up on her idea to mass produce the doll. People told her she’d never get anywhere unless she broke with her ideals and agreed to outsource the job. The Lil’ Bernie dolls represent what grassroots activism means to Engel: one idea by one person shown to a few people and passed on to a few more people until it snowballs. It has also turned Lil’ Bernie into a commodity. It took Engel from September to December to get the first batch of dolls out the door. The day after Christmas, she opened up sales again, selling 25 dolls within one minute and 200 in 11 hours. The dolls sell for $50 each, plus $7 for shipping. They’ll soon be on sale again at Lilbernie.com. Katie Levesque, 34, of Chicopee, was the very first person to order a doll. Engel tries to make between 10 and 15 dolls a week. She’d like to increase that number to 20 per week, while making time to eat, sleep, and run her tailoring and alterations shop, Bx Custom Sewn. She gave the real Bernie Sanders a Lil’ Bernie at his rally in Springfield last year.